The apartment has 70 m2 and was carefully reconstituted. It is full with charm and light; the rooms have big old wooden windows and one can enjoy the fabulous sight on Lisboa, which extend down the hill until the Tagus and even to the mountains of “Arrábida”, on the other bank of the river. 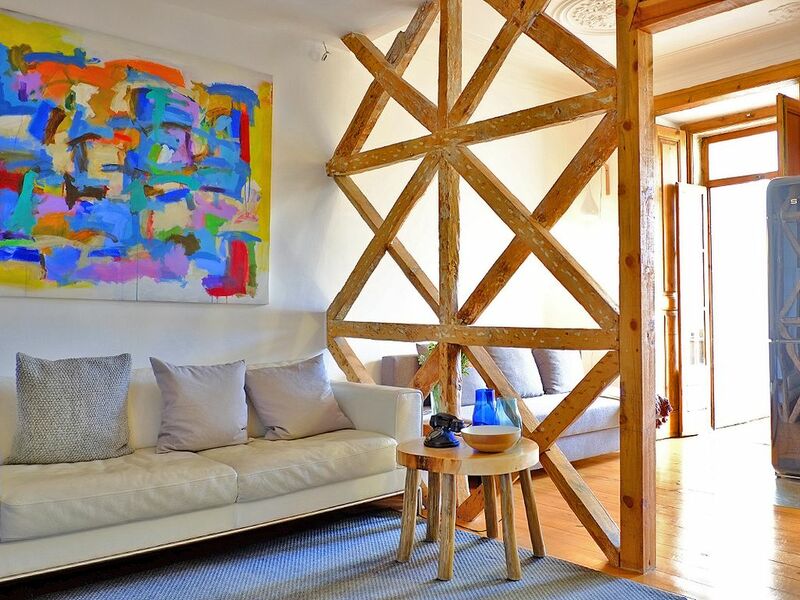 The apartment is like an art gallery: original paintings decorate the walls and change between art exhibitions. Really nice apartment in excellent neighborhood. very good recommendations from our host. The downside was the noise during the daytime, albeit we were not there very much during the day. Nice location, cute, nicely renovated apt. The apt was cleaned and nicely decorated. We stayed only one night but enjoy the great location next to a square. We stayed three nights at Denis' apartment, and loved exploring all of Lisbon from this location. And we walked from the subway (Rato stop) with our luggage and it took no more than 15 minutes (the taxi line at the airport was very long!). Patricia was very prompt in greeting us on the day of our arrival, and the directions to the apartment were excellent. The rooms are spacious, but it was just two of us staying there. We slept well because it is situated on a quiet street. Yes, there may be some noise from late night garbage trucks or the occasional late-night hamburger diner, but this is typical urban noise, and very minor. What may be more challenging for some visitors is the day-care/kindergarten activity occurring from about 8:30 am to 6:30 pm, with some breaks when the children are inside. This occurs right below the large kitchen window, and there are a LOT of kids. We loved watching the kids play, but if you are trying to read, or a have a conversation, you will need to close the double pane windows, and on a beautiful day, I like to have my windows open. And even with the windows closed, you can hear the kids. If you are the type of traveler who is up early and gone for the day, this will not be an issue. There are great bakeries and restaurants close by, and as another viewer mentioned, the lovely parks just up the street have very inviting cafes, too. clean apartment, super location, nice hosts! We loved walking everywhere from the Arte apartment--starting with two neighborhood parks with their enjoyable coffee kiosks, we could walk all the way to the Alfama to the east and Estrella to the west. The street is quiet, the apartment enjoyably quirky in design, with a fabulous view and directly overlooking a charming if rambunctious nursery school. (Just close the window if you don't like the sound of little voices.) Sofia provided excellent suggestions of nearby restaurants and was available for any questions. Location was convenient. View was beautiful. Location was, however, noisy due to a Day Care during the week and a restaurant on the other side of the building. Apartment was small for five people and limited for cooking. We have put in double glazed windows. Yes the fifth person has to sleep in the double sofa-bed, as previously informed...thank you!